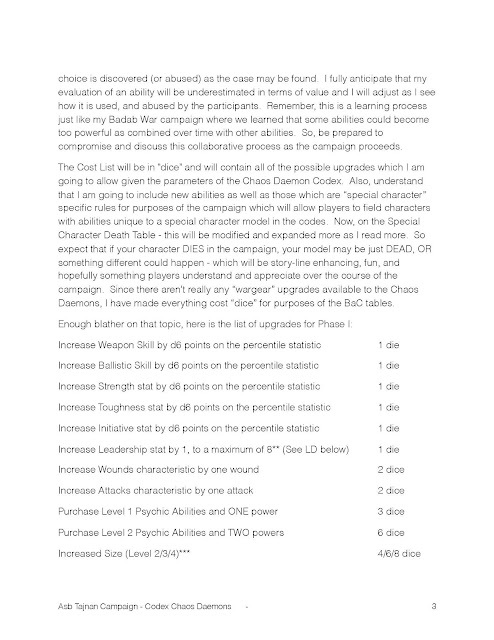 The Asb Tajnan Campaign Begins! 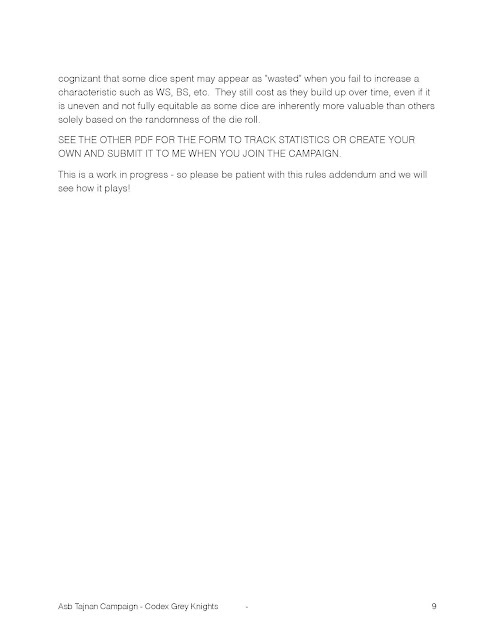 Above, we see the participants lining up to receive their awards for participation in the Asb Tajnan Campaign event. As you can all see, the participants are all seasoned veterans having fought through the "Long War" and continue to serve their Local Game Store by participating in yet another half-cocked idea! 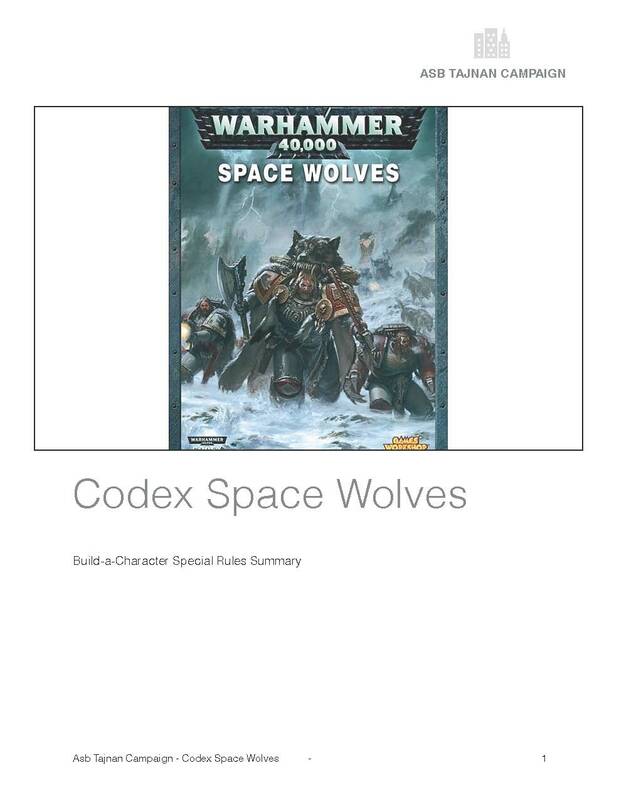 The Space Wolves player was caught unaware that there was an actual campaign going on - so he joined literally at the last moment, purchased some Space Wolves models, and managed to get ONE of them started and his girlfriend got the other one started. 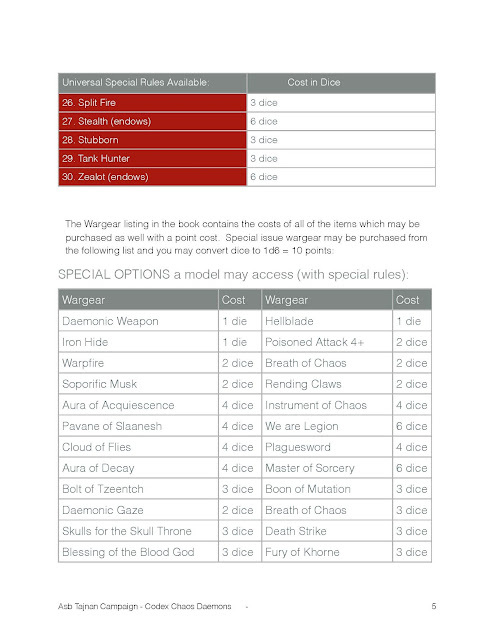 He borrowed some of the store's Crimson Fists to flesh out his force for the day. 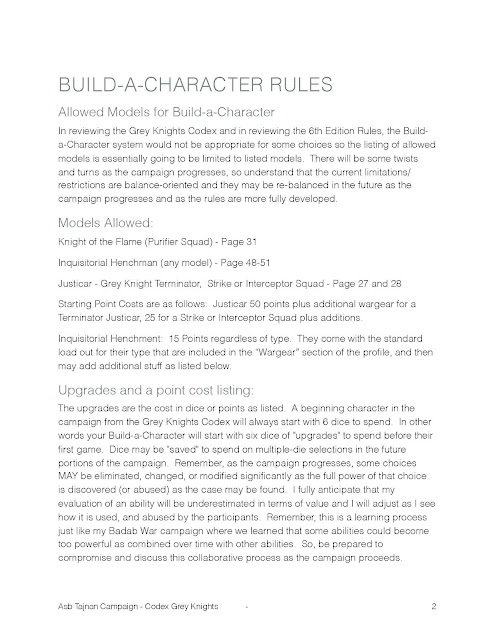 We gave him an A+ for effort - he got the figures the day before, and had two of them nearly completely built and one of them nearly completely painted - sans riders. 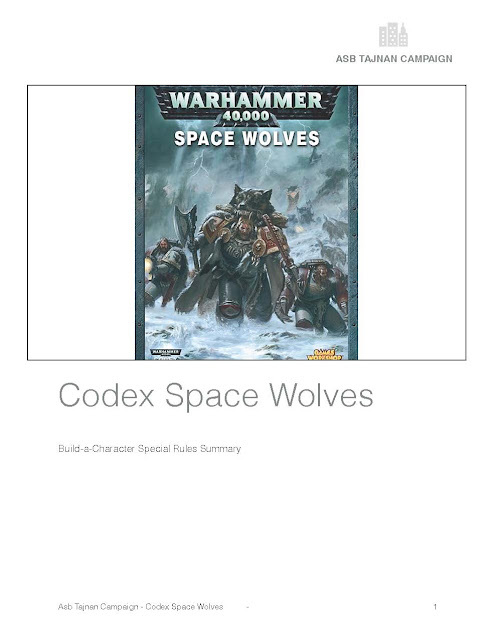 Here you can see the store army (a hodge podge of Space Marines abandoned or donated to the store) filling out the list for the Space Wolves player facing off against one of our more veteran gamers with his nearly completely painted Tau force! 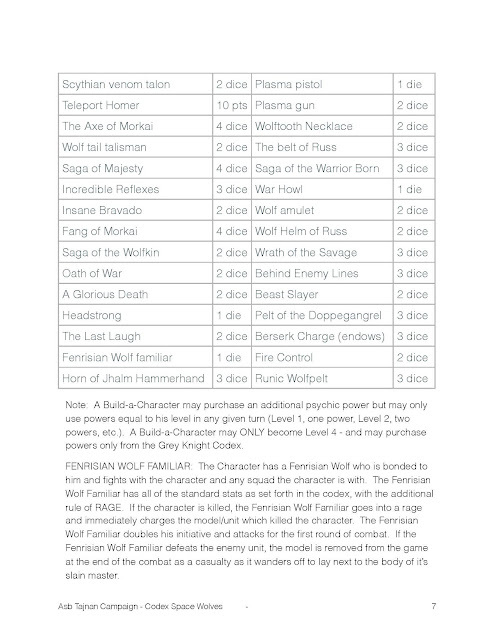 In the end, the poor Space Wolves were tabled and the total victory point was Tau 15, Space Wolves 9. A good showing for a player in his second full game using a borrowed army! 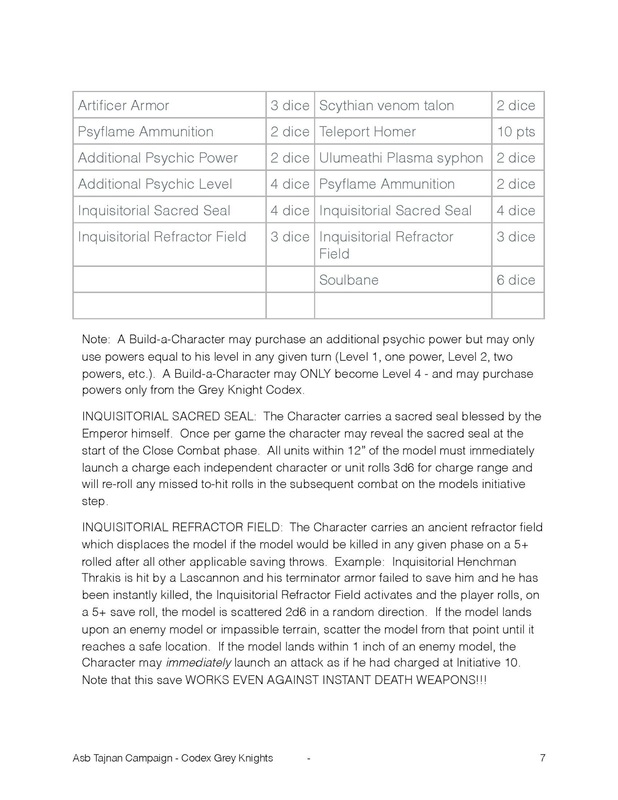 Into the Swamps of Lokrakhul to locate a sacred artifact to open a vault in an Imperial Shrine. Here the Imperial Guard using armored Hydra Flak tanks advances into the swamps against the hordes of Chaos bent on gaining access to the Imperial Shrine so they can desecrate the contents with their foul daemonic spawn! 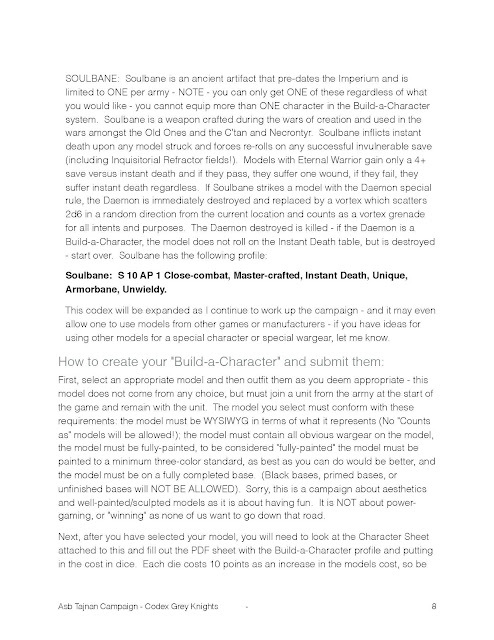 More views of the battle. 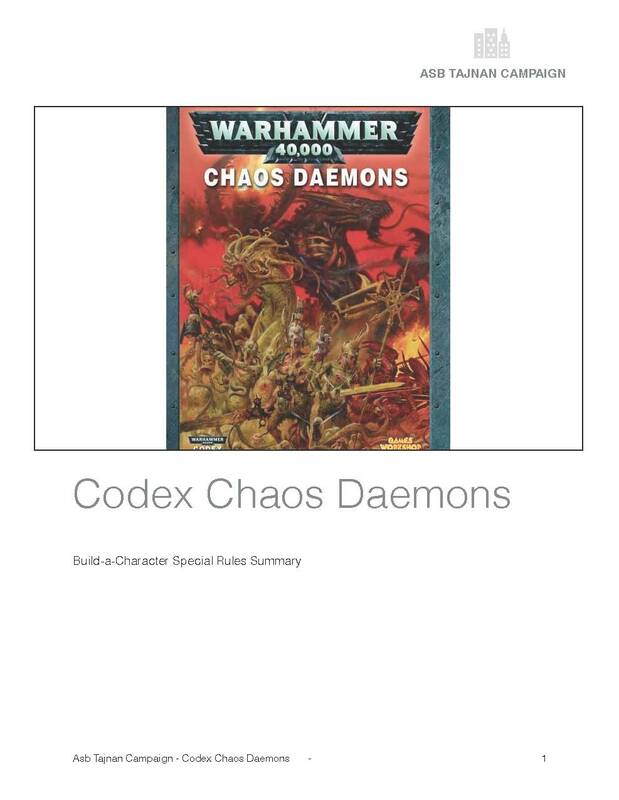 Unbeknownst to the Imperium the Dark Eldar had also come down to foil the Imperiums attempt to rescue the contents of the downed shuttle craft and to claim victims for their depraved games. 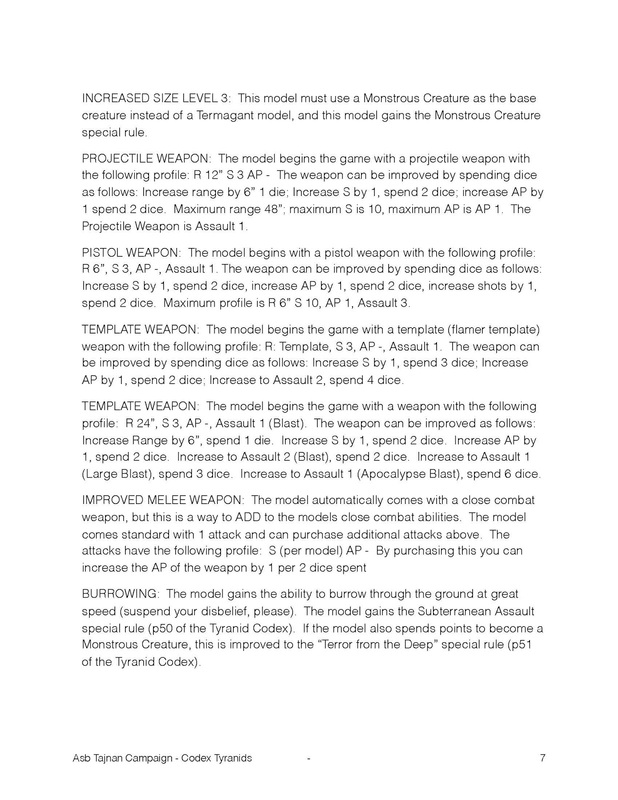 Another view of the battles in the LokraKhul Swamps. 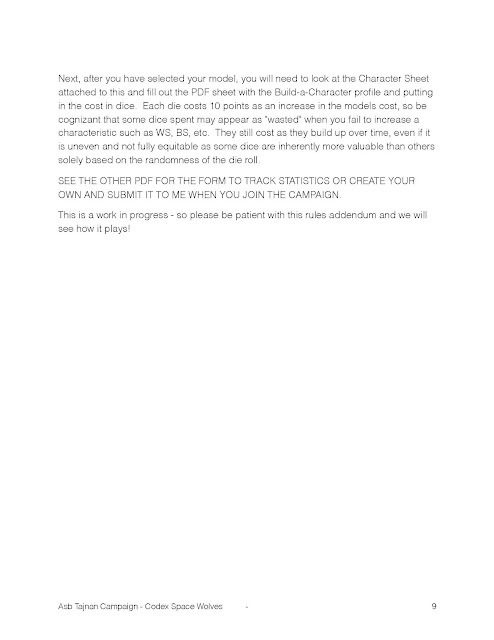 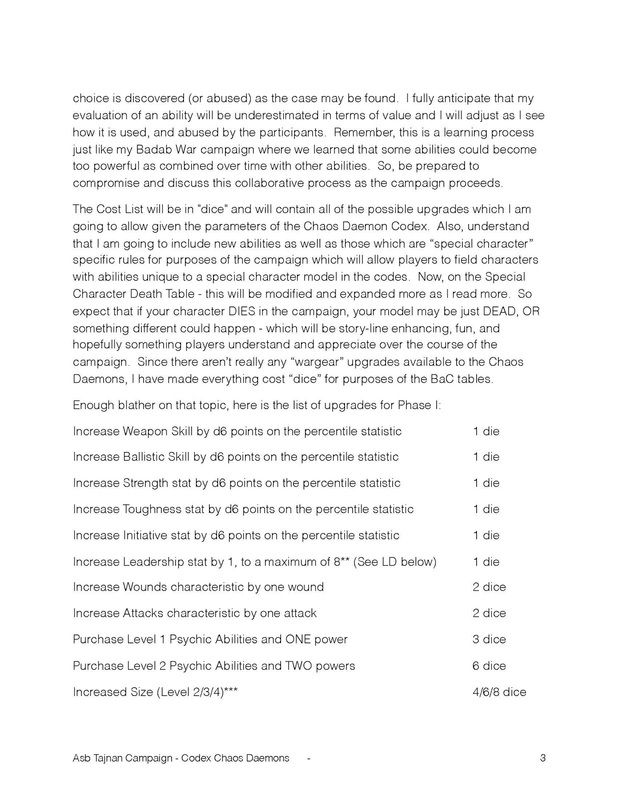 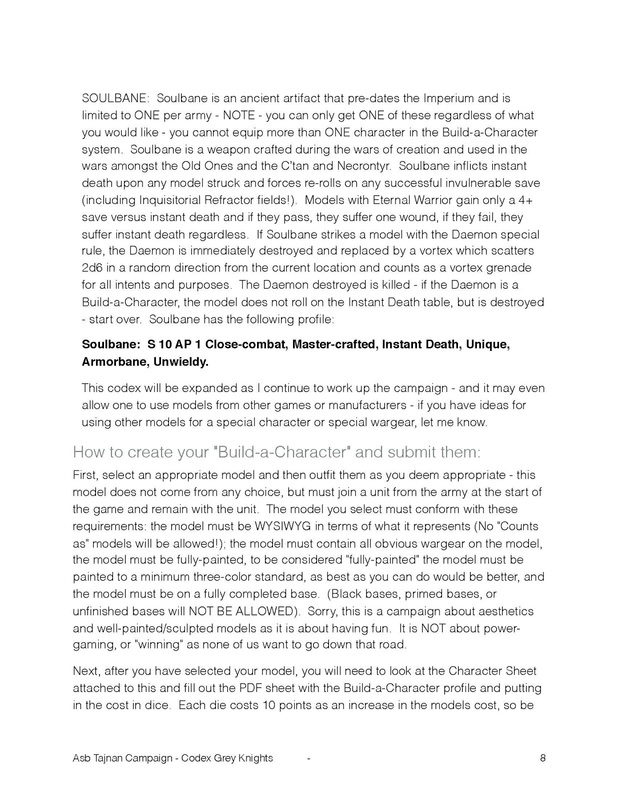 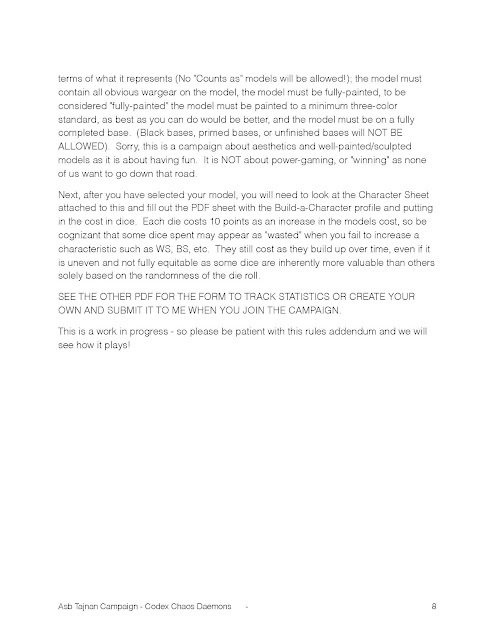 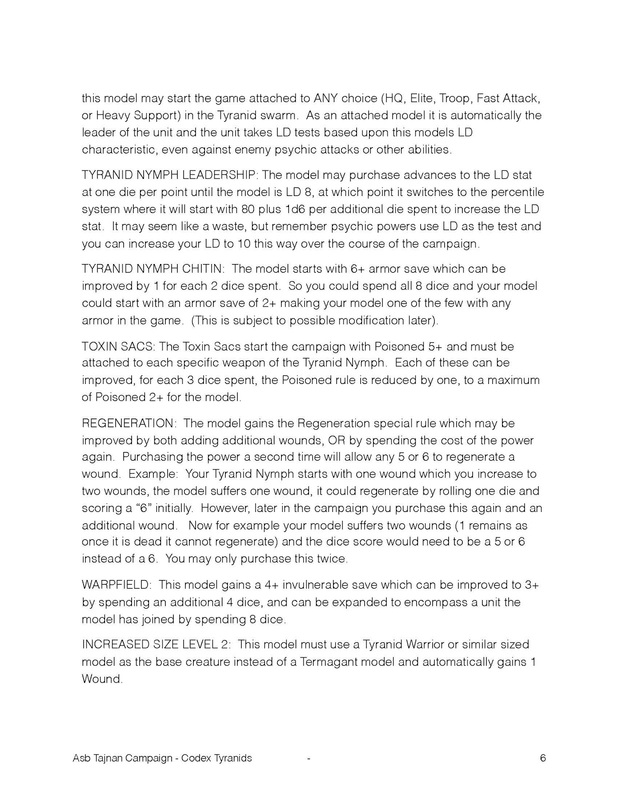 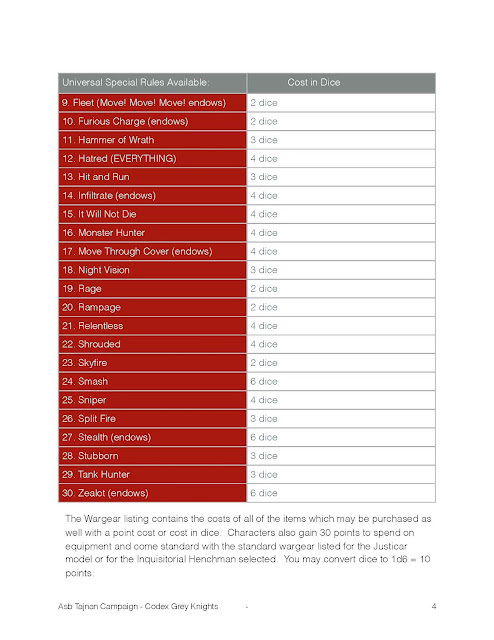 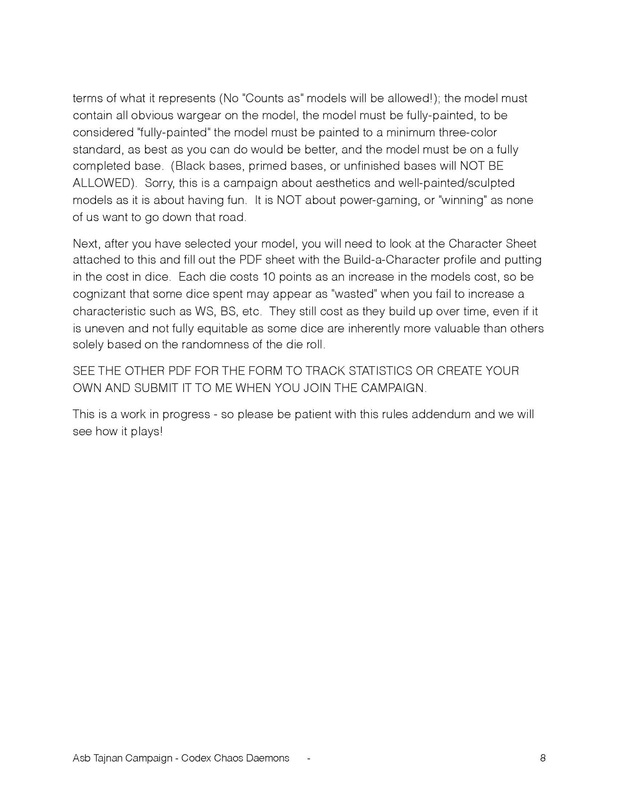 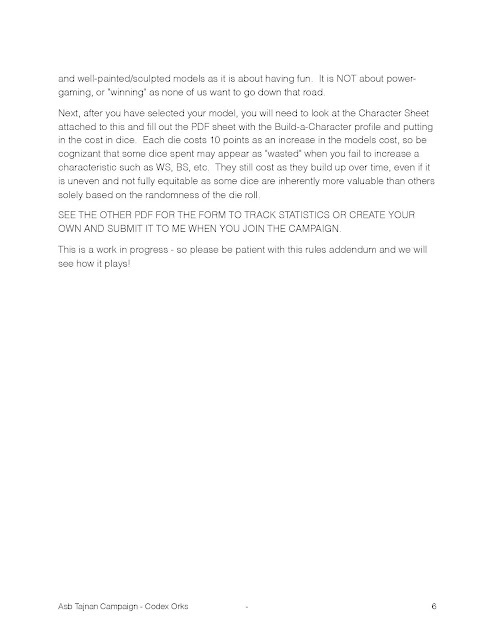 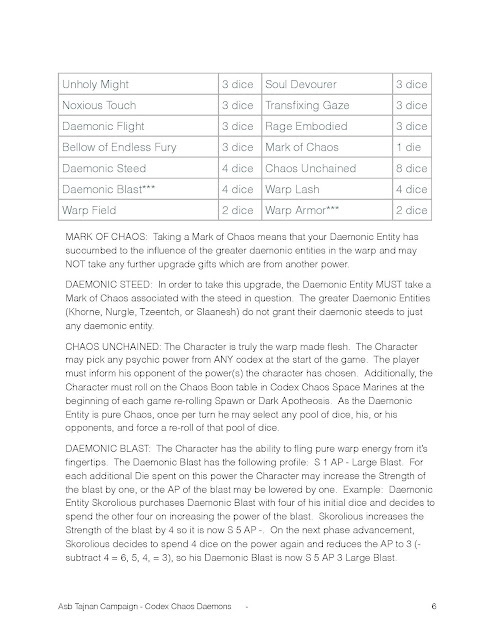 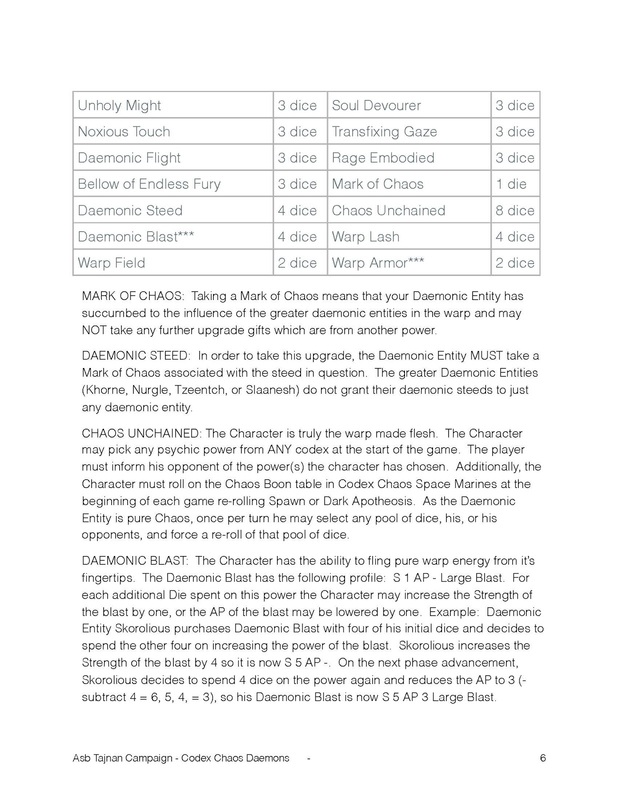 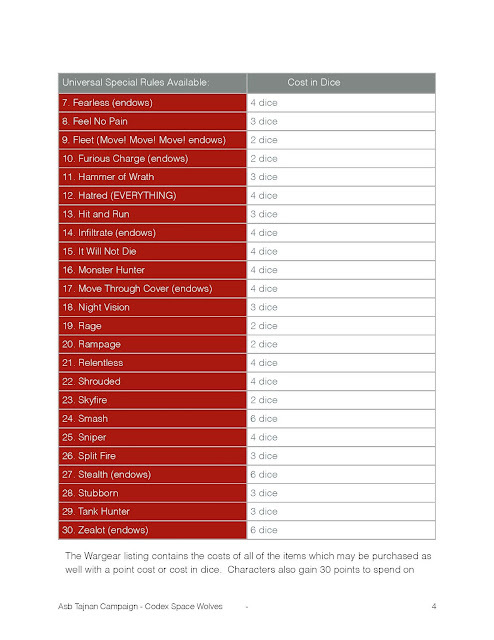 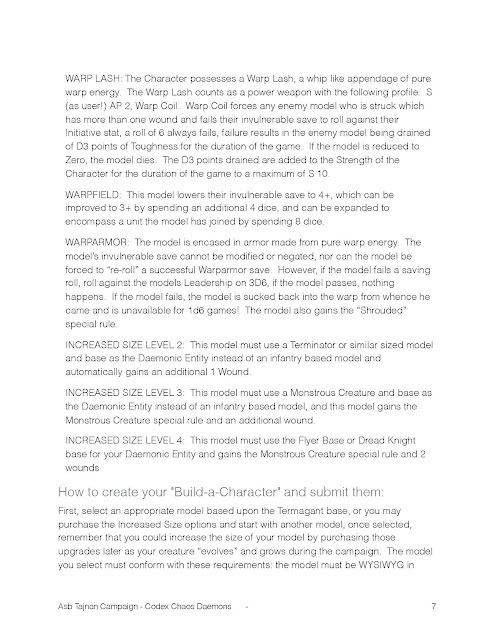 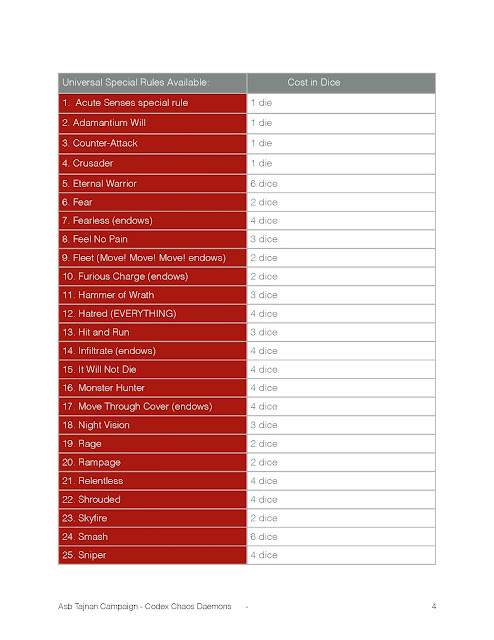 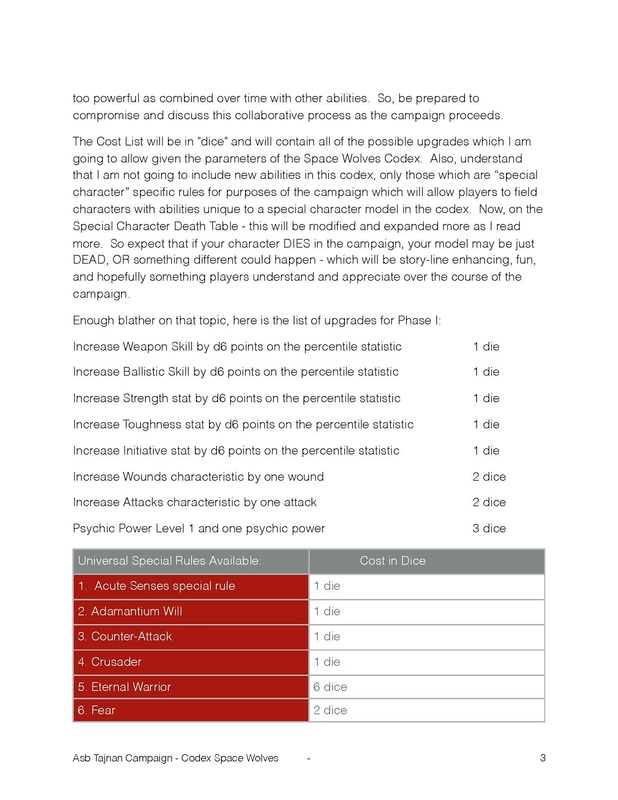 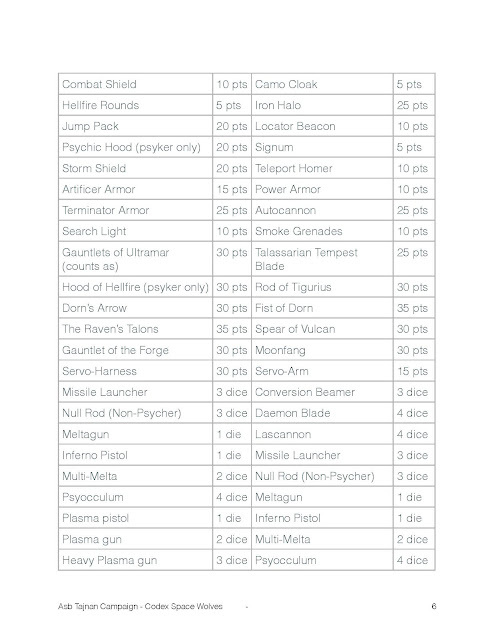 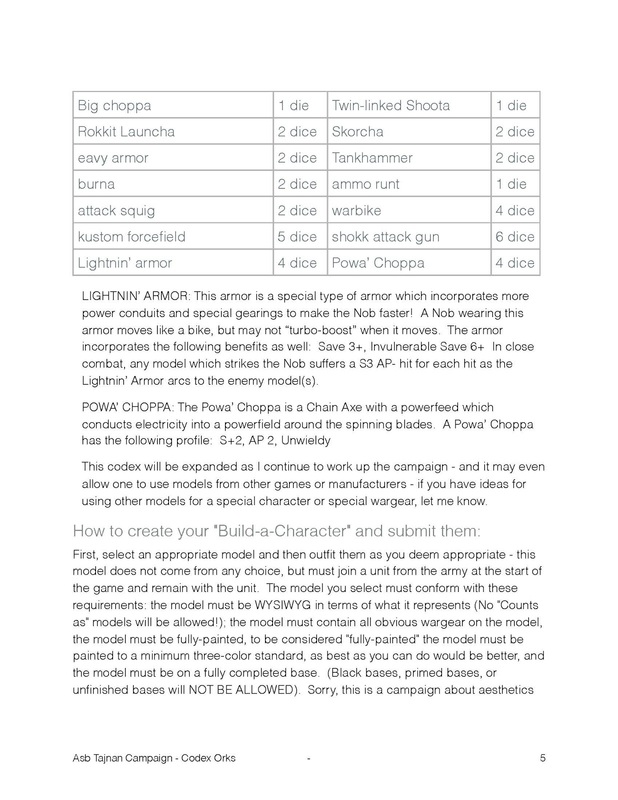 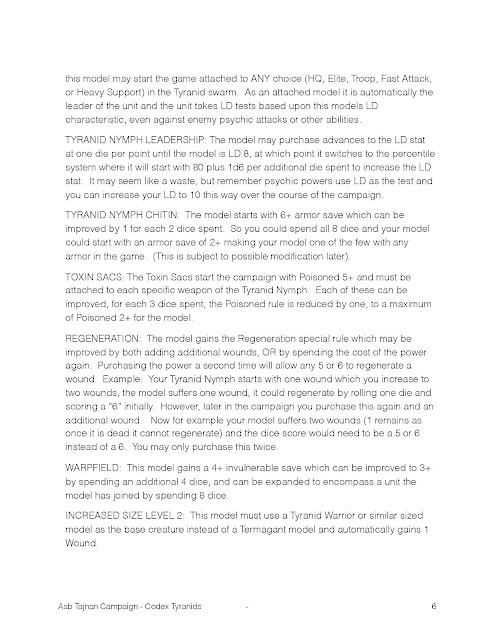 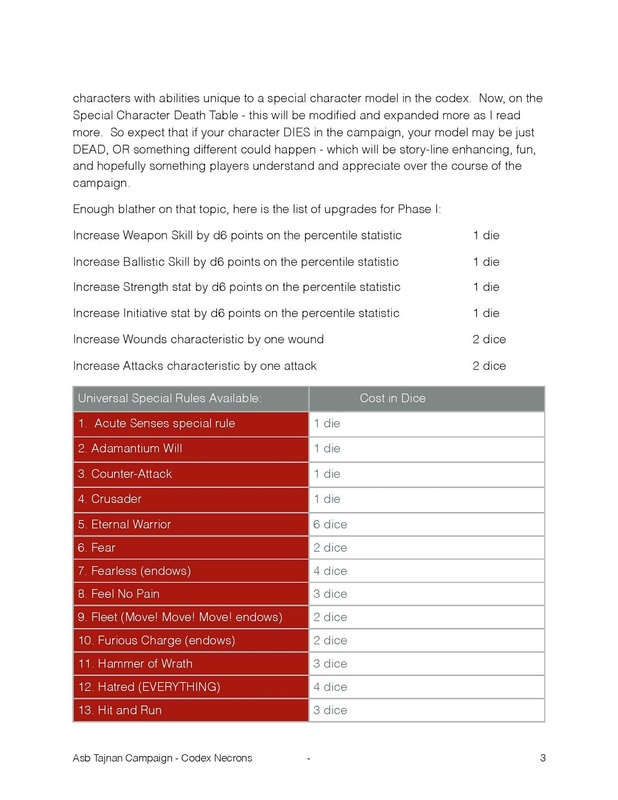 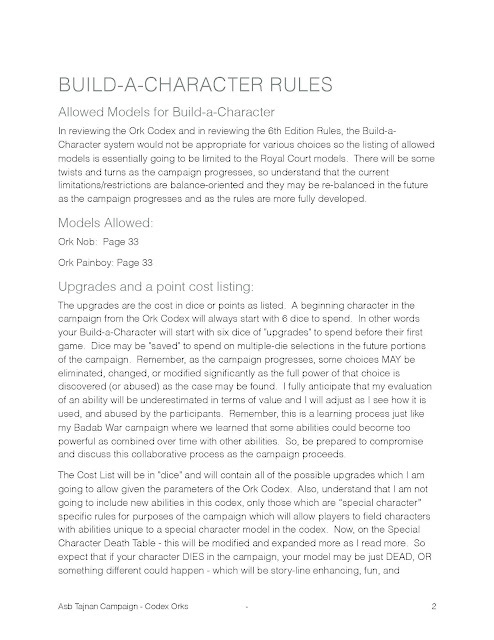 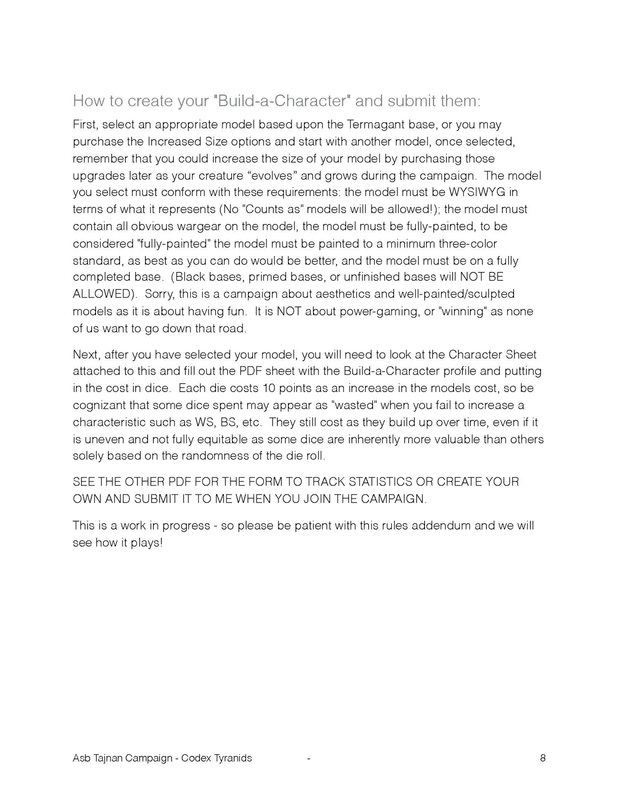 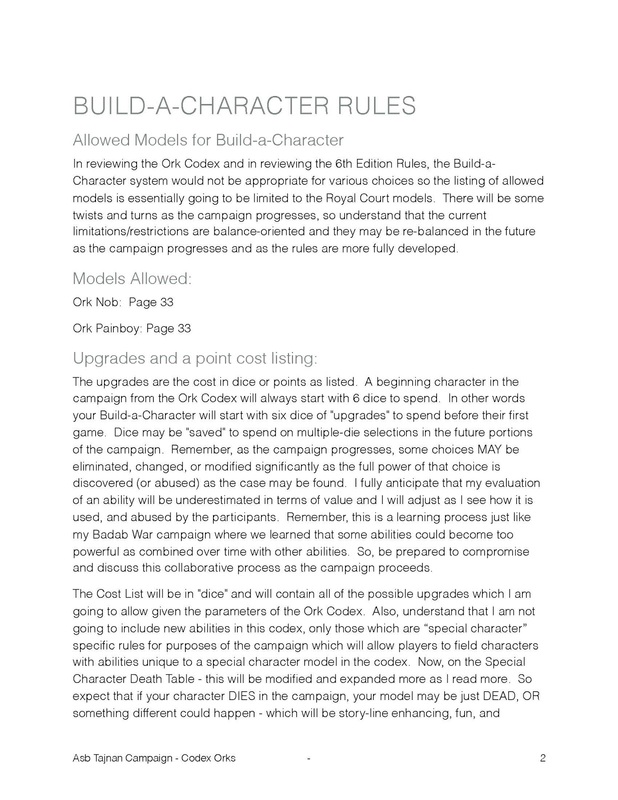 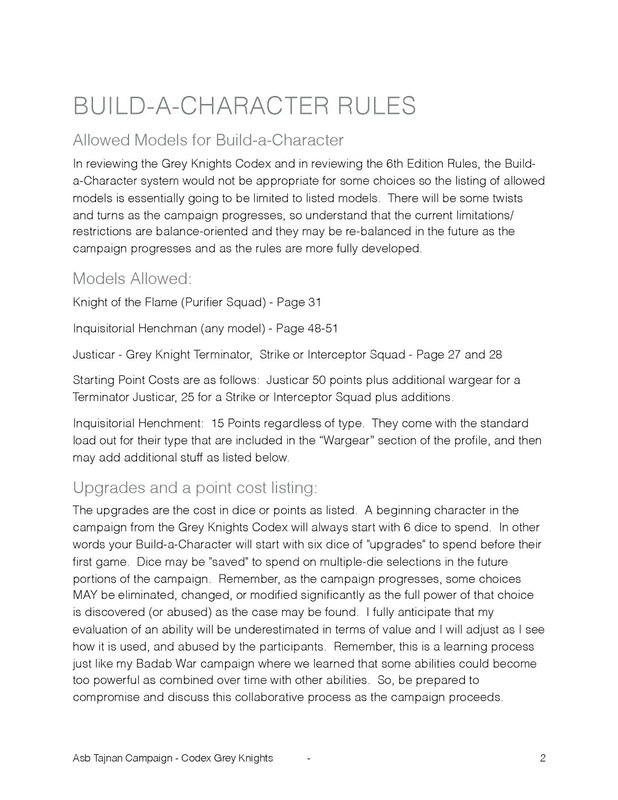 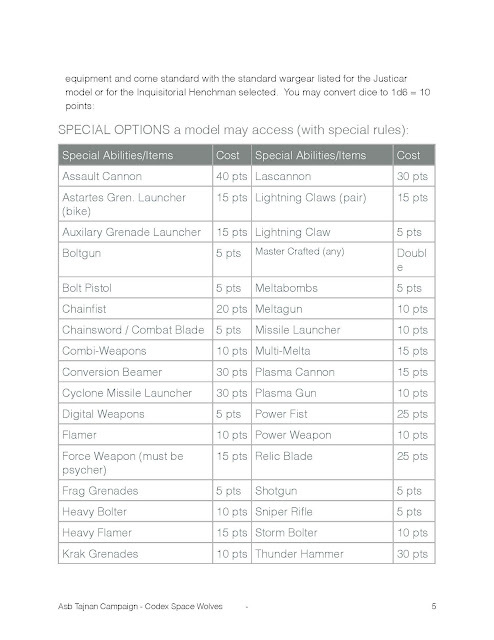 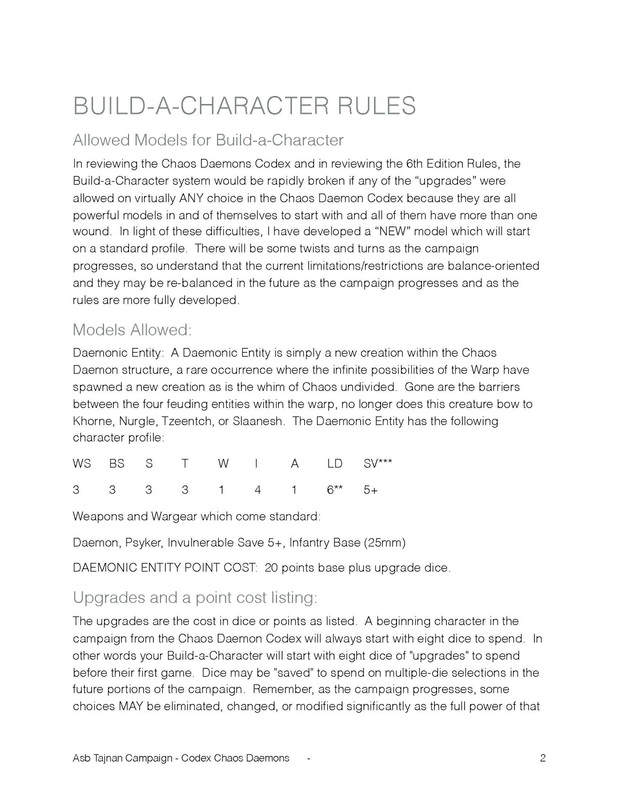 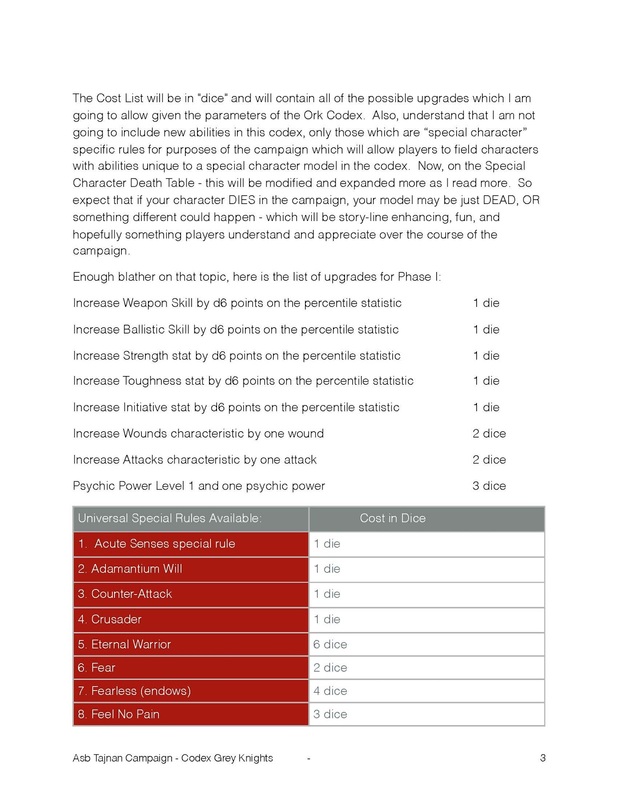 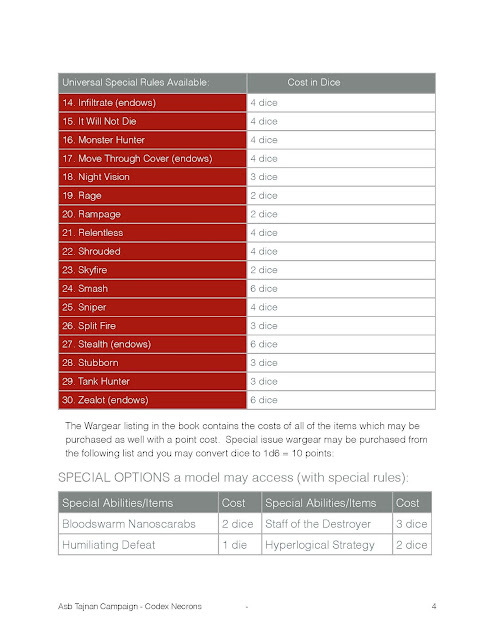 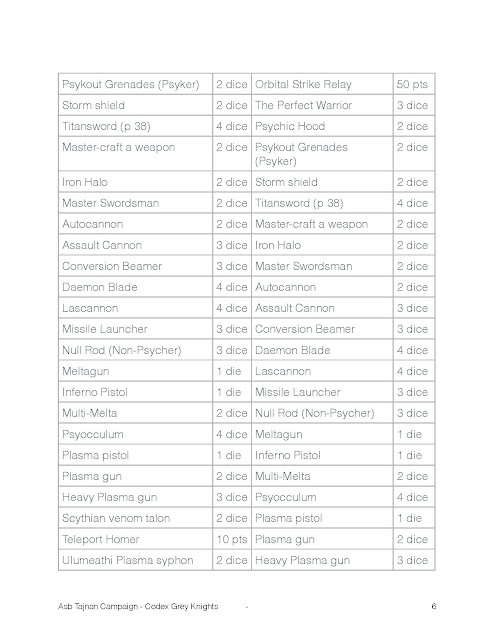 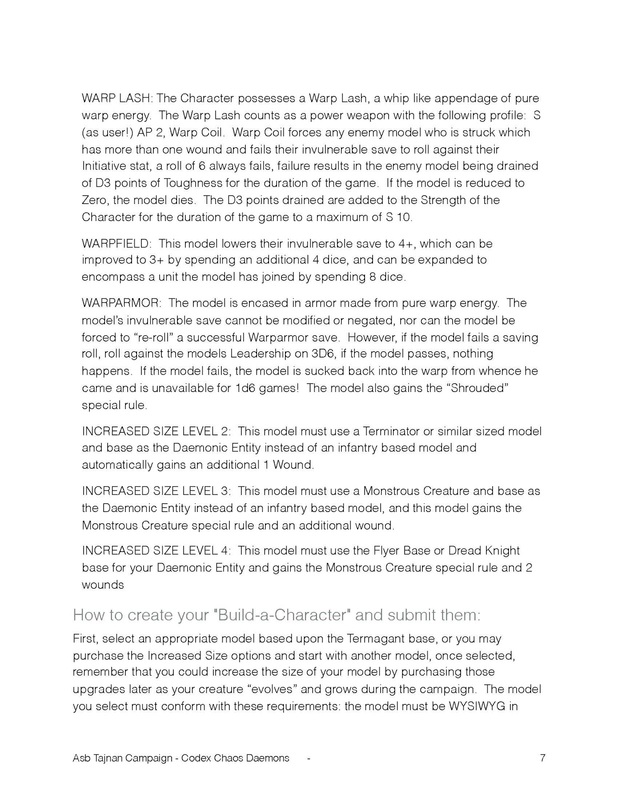 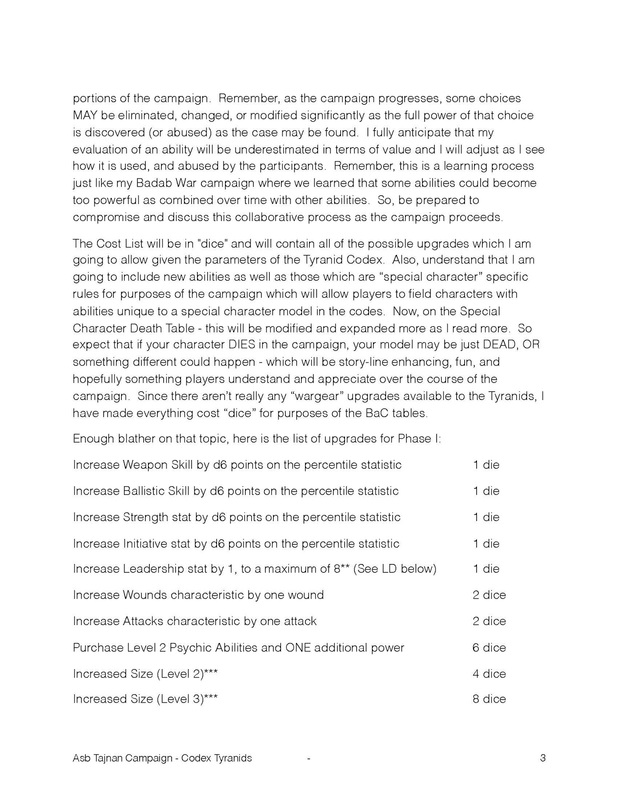 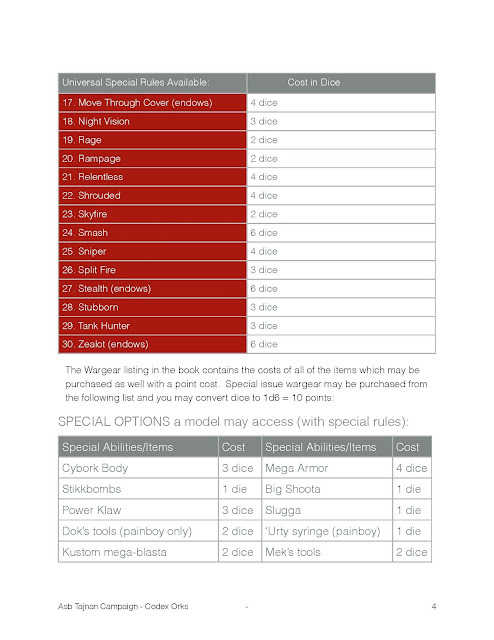 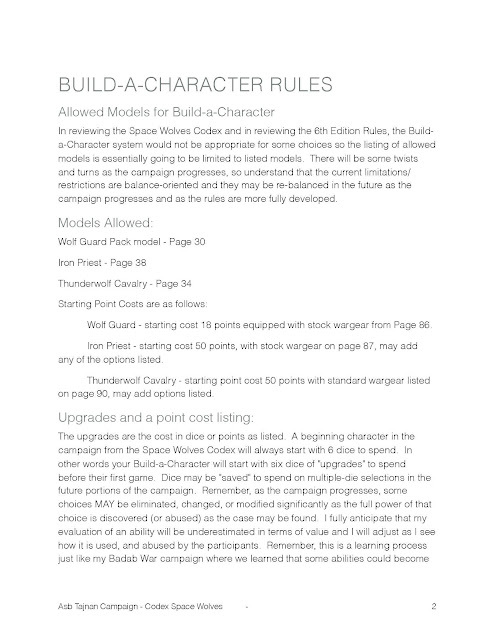 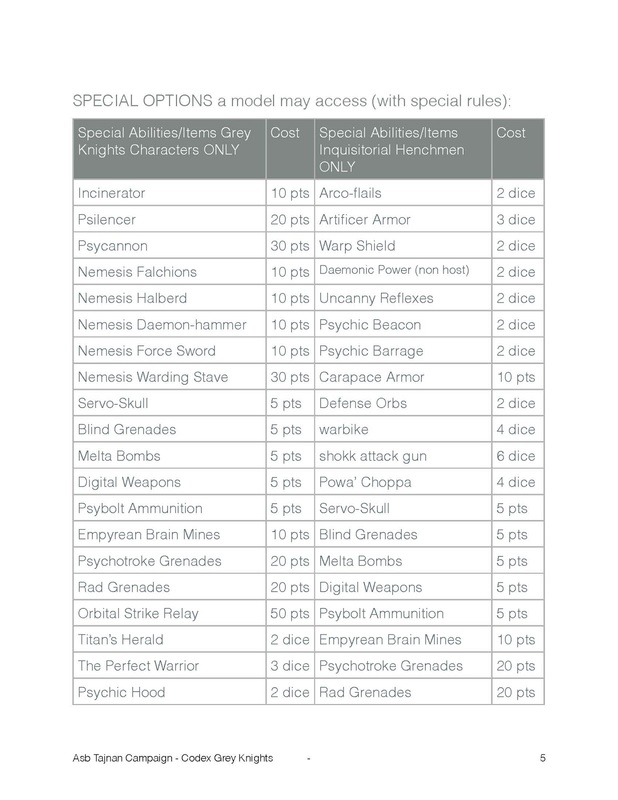 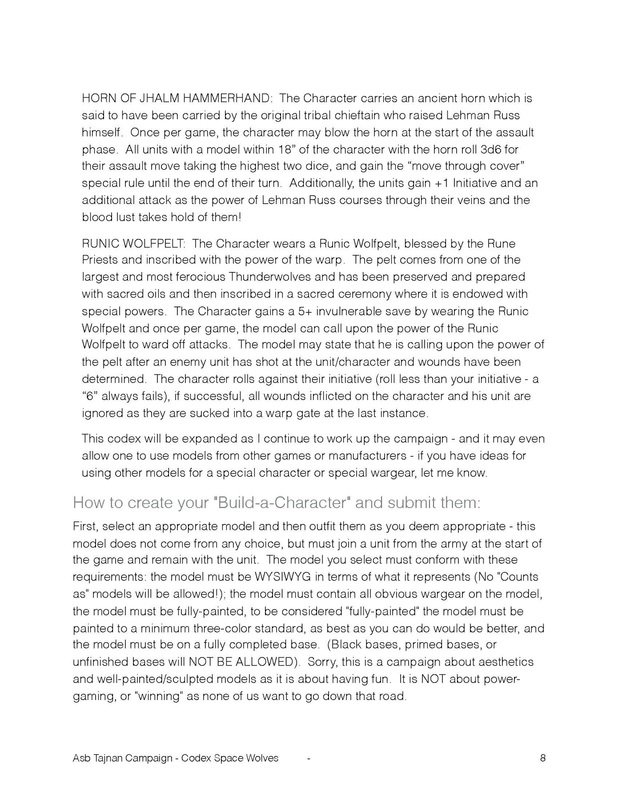 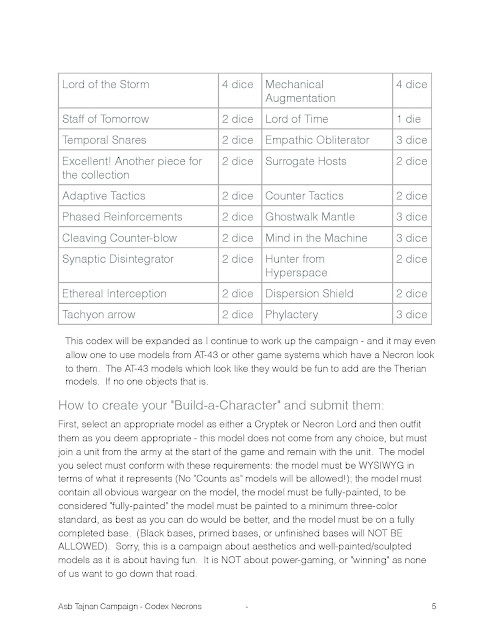 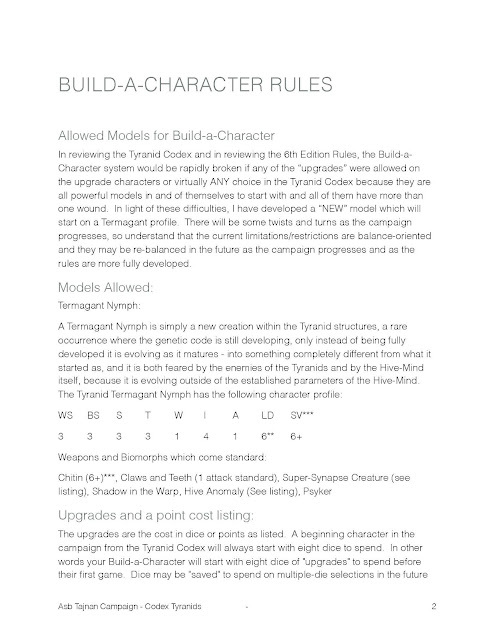 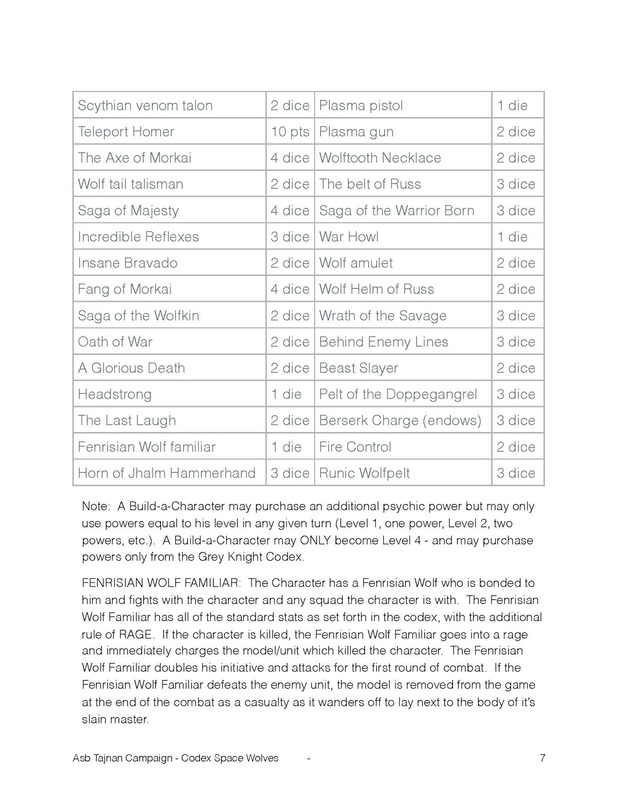 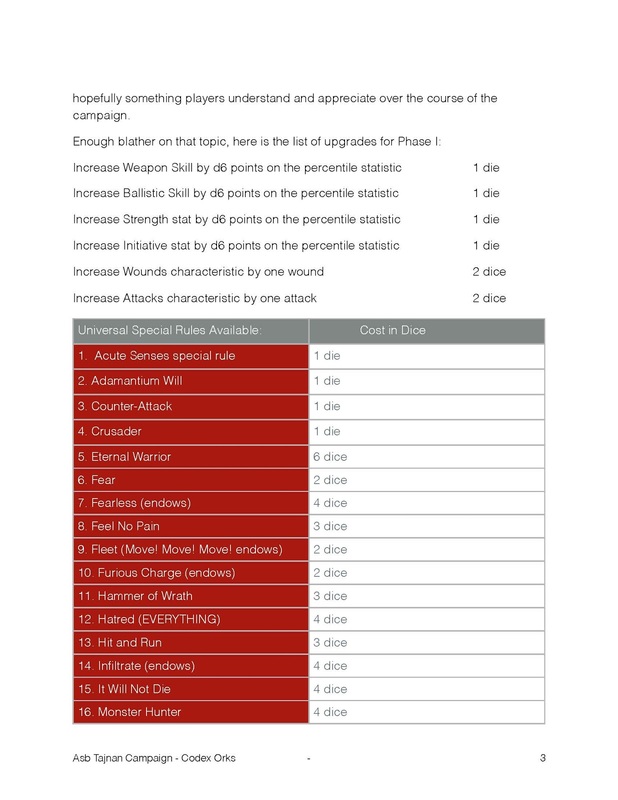 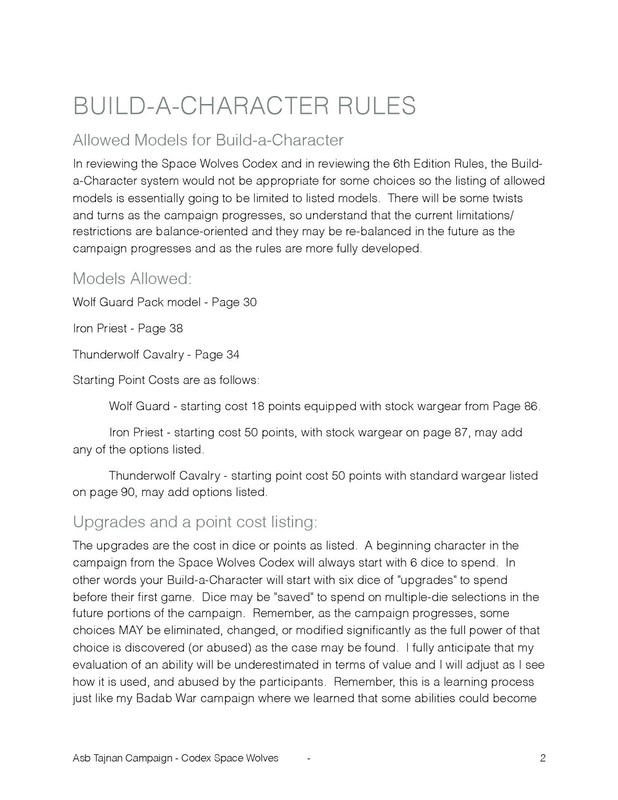 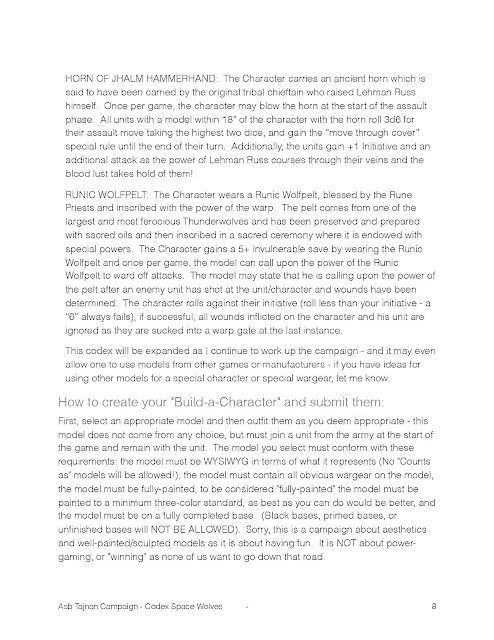 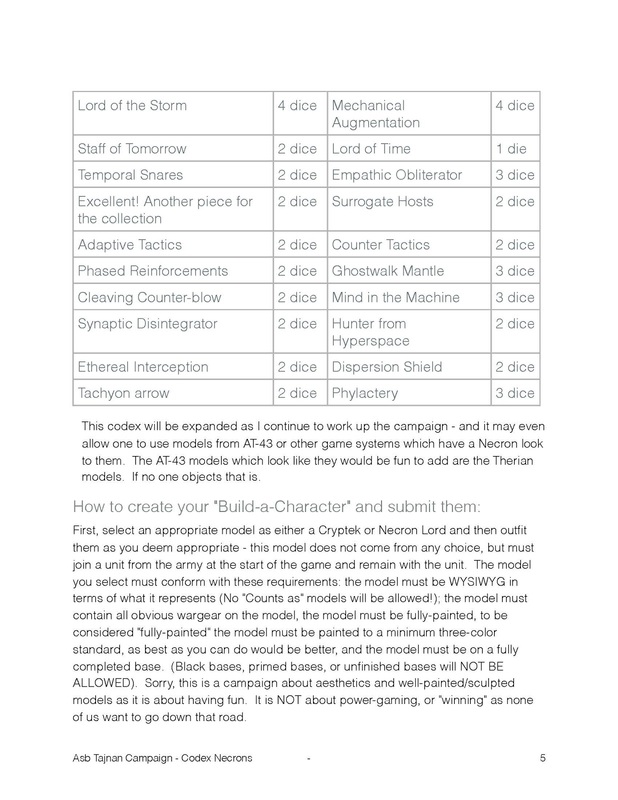 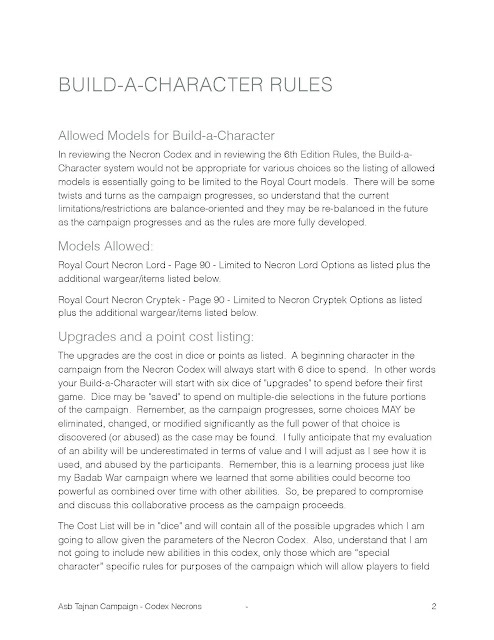 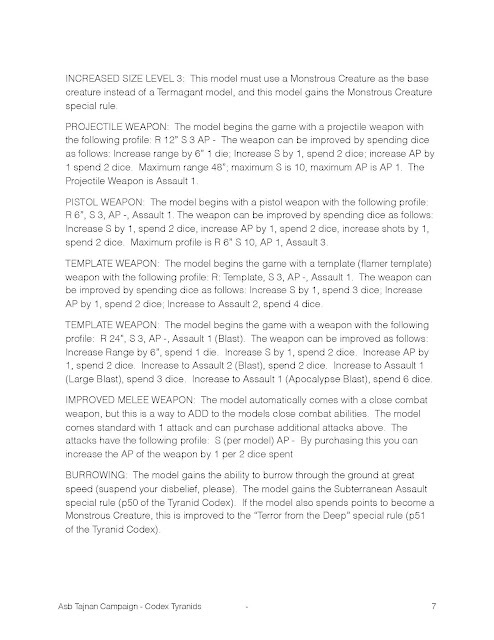 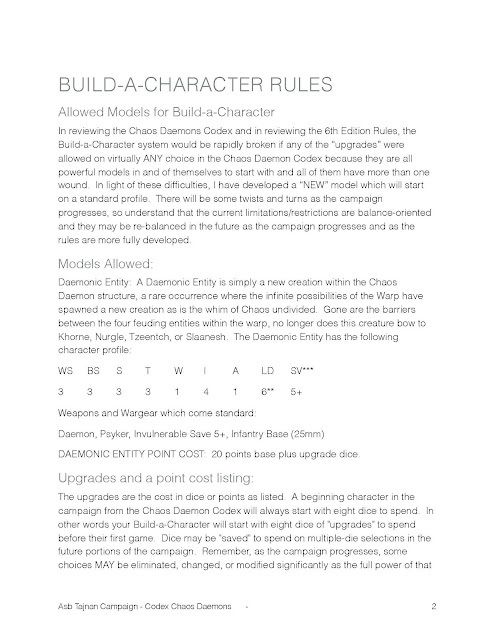 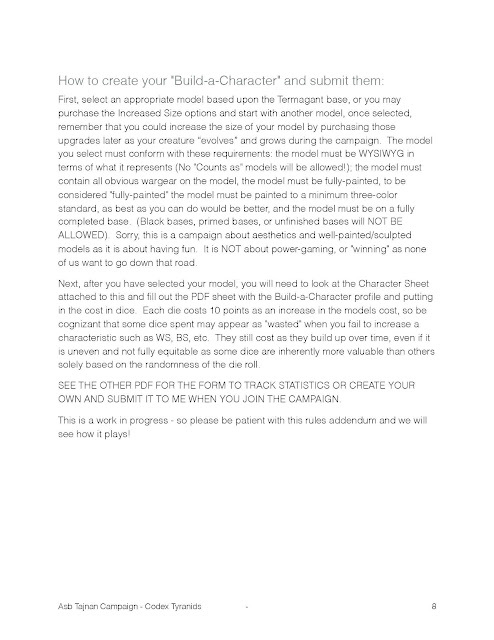 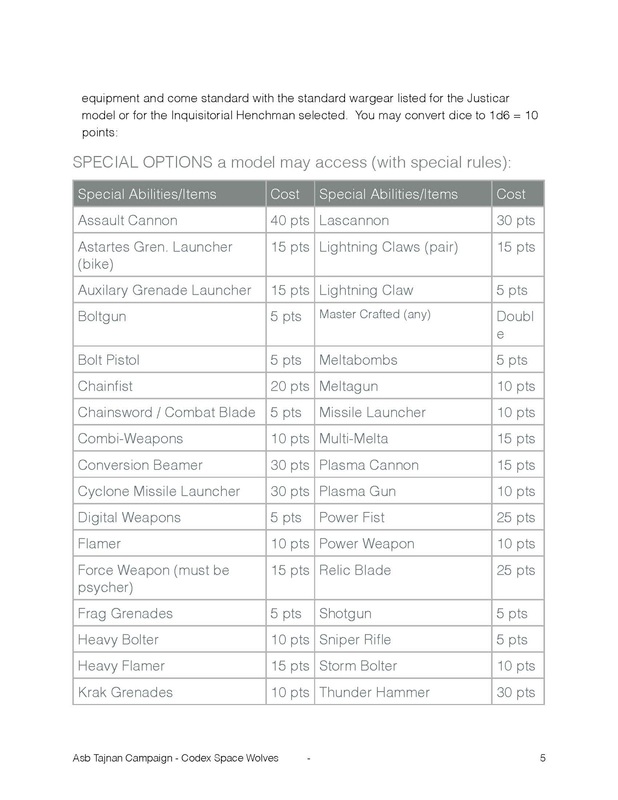 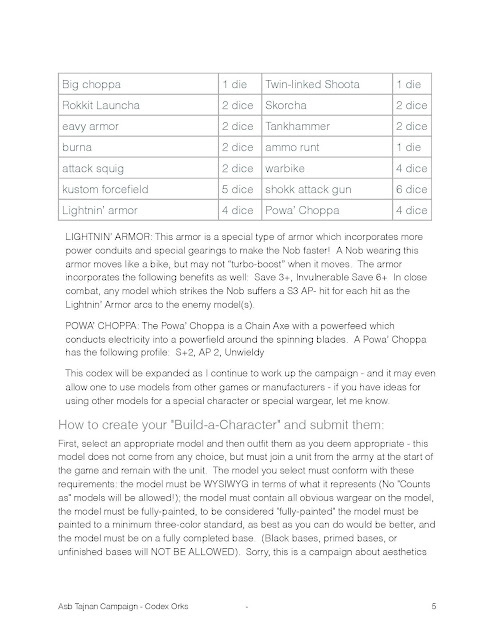 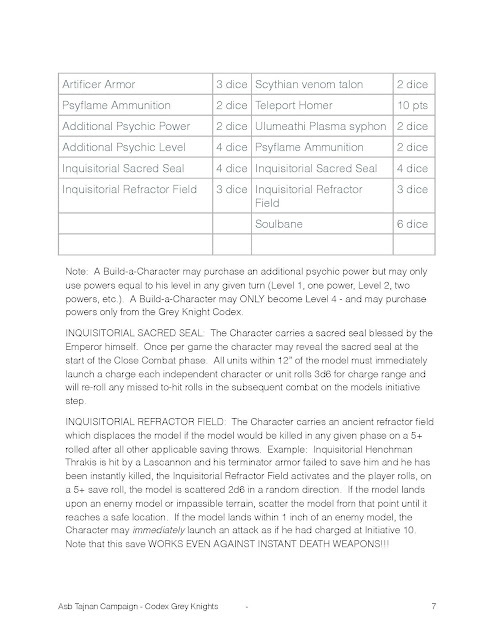 So, another update - and this one is a big one as it contains three codex updates for our Build-a-Character campaign, Necron, Tyranid, and Ork. 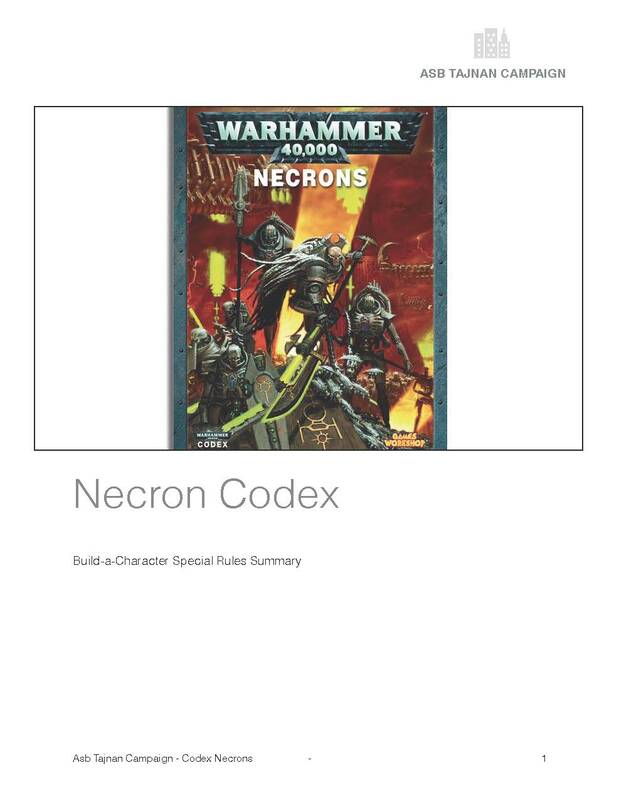 These aren't as extensive, because for the most part they are not as flexible as some of the other codices. 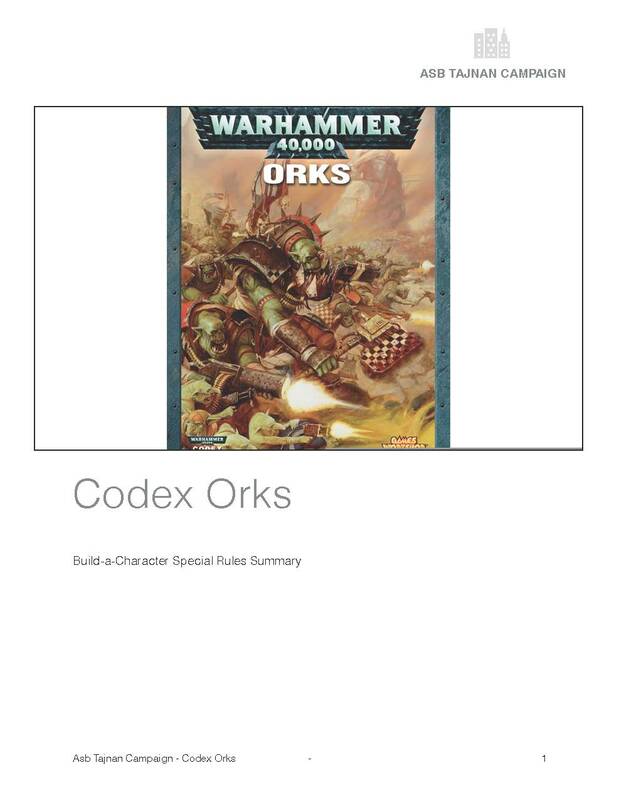 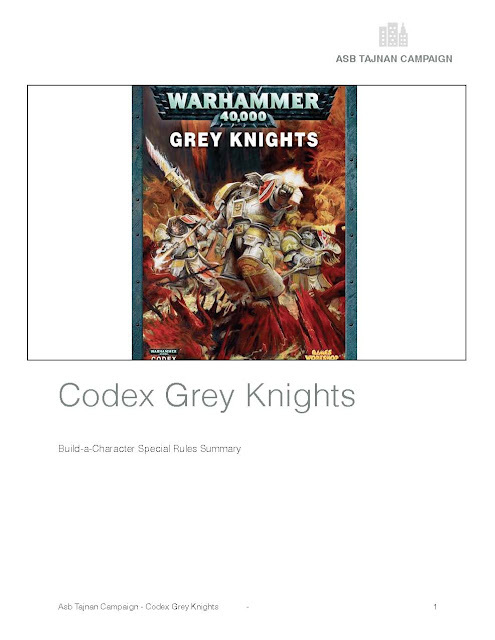 The Ork Codex is the oldest, using the old format. 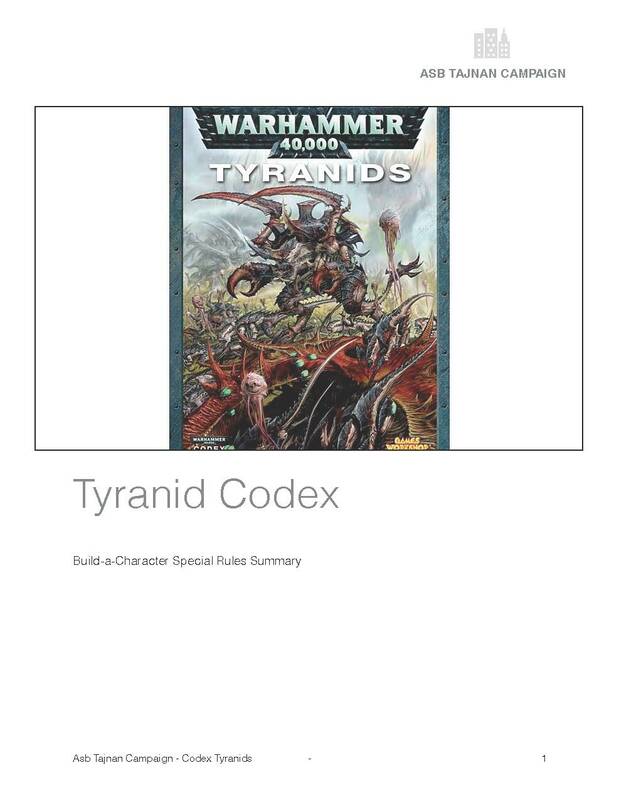 The Tyranid posed the most problems because of the lack of lower powered models and any "independent thought" within the Codex. The Necrons were limited by the backstory to only those within the Royal Court who are vying for power within the dynasty. 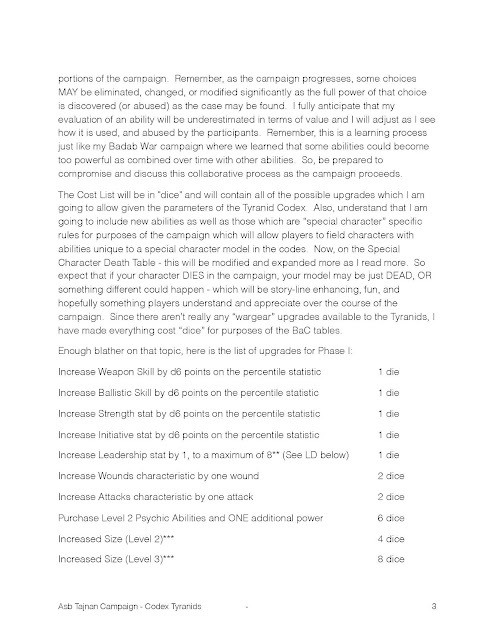 So, review, enjoy, and if you have suggestions, please post!